Wedding Wednesday: Two HUGE updates! 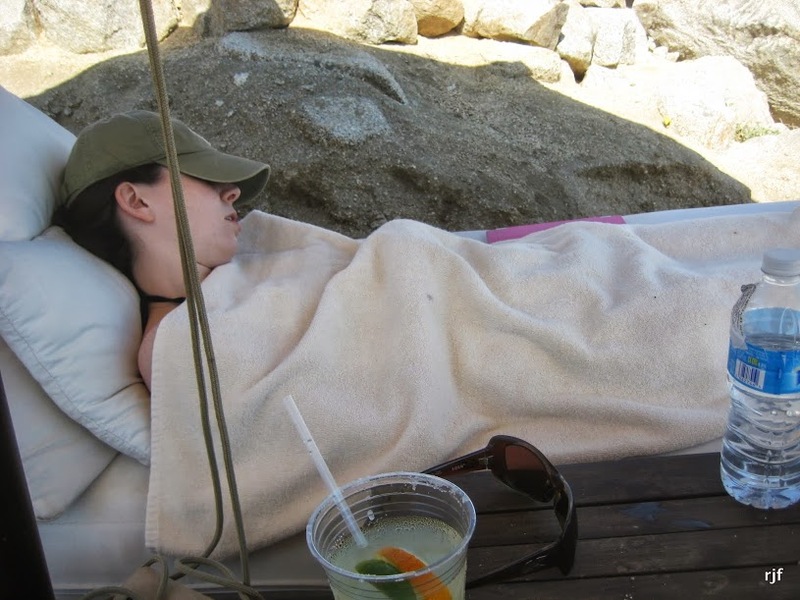 Standard daily activity: napping on a comfy chaise at the edge of a cliff overlooking the ocean with a margarita nearby. The umbrella, hat, towel blanket, and SPF 60 are how you don’t get sunburned when you’re as pale as I am. In short, I’m the most exciting travel buddy ever. Kidding. We had the best time splitting our day between our room with an ocean view and the most beautiful balcony, one of the resort’s three infinity pools, the swim-up bar, and a chaise by the ocean. Not bad, eh? I even got through two books (The Five Love Languages and This is Where I Leave You–I highly recommend the latter.) I could blab all day about how awesome the resort was, how I had the best massage of my life, but I’ll just say this: if you’re ever thinking about taking a trip to Cabo do yourself a favor and book a stay at Hacienda Encantada. Robert and I’ve often joked about how awesome it would be if we could just run away together for a little while without all of that life stuff to worry about. Well, we did. And it was better than I ever imagined it would be. Okay, now on to the really big Wedding Wednesday stuff. Huge update numero uno…drumroll please…we’re buying a house! WHAT?! I know. If it feels like that came out of absolutely nowhere, join the club. Here’s how it all went down. About a month ago Robert and I had a conversation in which we realized we both want to be in Chicago for the foreseeable future. We also noticed that lots of our friends were buying places so we started to consider whether this was even a possibility for us. After some research and number crunching we realized we could pull it off. Then we started to factor in the low interest rates, the fact that we overpay for rent, the fact that we’d like to have more space, and yadda yadda yadda. Next thing you know we’re sitting in a real estate agent’s office on a Tuesday night. That Friday afternoon she shows us the first place. Saturday morning we put a bid on that first (and only) place we saw. True story. We negotiate back and forth with the sellers through the weekend and by Memorial Day they accept our final bid. Craziness, right? We still can’t believe we put a bid on the. first. place. we. saw., but it had absolutely everything we were looking for and so much more. Lots more coming in future posts about how we ended up in the Logan Square neighborhood (one word: space), details, potential future projects for the home, etc. If all goes according to plan we’ll be closing in mid-July and moving in shortly thereafter. I’m still in shock that this is happening, but I’m so excited for the life and experiences that will take place in that home of ours to be. Huge update numero dos….our wedding website is LIVE! Check it out at http://paigerobert.wix.com/paigeandrobert. We spent a long time creating and designing the site together, so I’m thrilled it’s finally out there! Now people can start booking hotel rooms. It’s really happening!! So there you have it folks! Basically nothing exciting going on around here : ) Ha! The next month or so is sure to be just as nutty, but I hope to be back very soon with some delicious recipes. Because even when you and your fiance buy a house, make a wedding website, and hold down jobs, you’ve still gotta eat. Speaking of which…two words regarding the new kitchen: COUNTER SPACE! Okay, one more: PANTRY! This entry was posted in Wedding on June 12, 2013 by Paige Greenfield.